HE the Minister of Economy and Commerce Sheikh Ahmed bin Jassim bin Mohamed al-Thani (centre) participating in the dialogue session in New York. Qatar's economy has proved its strength and resilience in the face of many global challenges which affected economies of the developed countries, HE the Minister of Economy and Commerce Sheikh Ahmed bin Jassim bin Mohamed al-Thani affirmed. “Despite the fact that more than three months have elapsed since the illegal siege on the State of Qatar to undermine its position as an economically independent and sovereign State, Qatar has succeeded in strengthening its power and independence more than ever,” he explained. 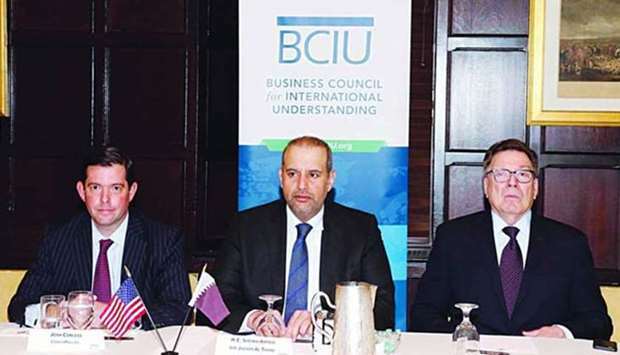 HE the Minister was participating in a dialogue session organised by the Business Council for International Understanding at Harvard Club in New York under the title "The Qatari economy under the current siege and the future". 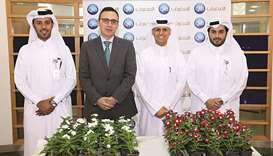 The event was held on the sidelines of Qatar's participation in the 72nd session of the UN General Assembly. According to a statement issued on Friday by the Ministry of Economy and Commerce, the dialogue session was attended by elite decision-makers, executive heads and senior diplomatic officials. “The State of Qatar managed, under the wise guidance of the His Highness the Emir Sheikh Tamim bin Hamad al-Thani, to break the siege by activating its strategies and pre-emptive plans that have been in place for many years to address any local or global crises,” HE Sheikh Ahmed pointed out. These efforts contributed to the maintenance of the normal daily life in the State of Qatar by finding alternative markets to the siege countries to import goods and services. 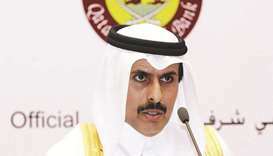 “The State of Qatar is working on developing the necessary mechanisms to reduce costs and improve speed, time and efficiency required for the import of goods and services,” he said while noting that the blockade contributed to expediting the pace of launching initiatives, programmes and laws, particularly those related to investment. 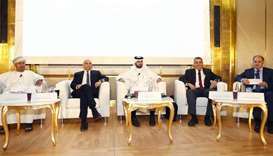 The measures imposed by the siege countries had a positive impact on the economy, he said. The State succeeded in establishing alternative and direct trade routes with a number of strategic venues around the world within a few days of the imposition of the blockade. After the arbitrary closure of its only land border crossing, Qatar used Hamad International Airport, one of the best airports in the world, to ensure the normal movement of flights and cargo to more than 150 destinations around the world via Qatar Airways, the best airline in the world. He also referred to the launch of Hamad Port earlier this month, adding that the cost of this project is estimated at $7.4bn and is capable of accommodating up to 7.5mn containers a year. He pointed out that Qatar has all the logistical capabilities needed to import goods directly to enhance its status as a transit point for trade in the Middle East region. 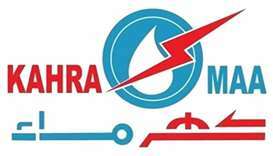 In the same context, HE the Minister pointed out that the opening of Hamad Port project comes as part of a broader strategy aimed at ensuring the continued flow of alternative consumer goods and products to local markets at the same level as before the crisis, adding that Qatar managed through the port to reduce the direct negative consequences of the blockade, and that the project will make the State of Qatar an important commercial centre in the region. Regarding Qatar's economy, Sheikh Ahmed highlighted the International Monetary Fund (IMF) report which affirmed that the Qatari banking sector remains sound, with high asset quality and strong capitalisation, adding that Supreme Council for Economic Affairs and Investment approved the second national development strategy which is characterised by a greater focus on diversification of economic activity. The IMF said that despite rising transport and food costs, overall inflation remained subdued 0.8% year-on-year-basis in June and 0.2% in July. As for the advantages of the business environment in the State of Qatar, HE the Minister noted that the huge natural resources built on the revenues of natural gas exports contributed to the strength of the Qatari economy and helped it withstand the arbitrary measures taken by the neighbouring countries, especially after Qatar announced its intention to increase its gas production by 30%. The State has developed flexible economic policies that have contributed to enhancing the ease of doing business through the launch of 'Invest in Qatar' office, which facilitates all procedures for the foreign investor and provides support at all stages of investment, in addition to providing advanced electronic services for the establishment of businesses, in addition to economic and logistic zones that meet all the needs of the investor. In this regard, HE Sheikh Ahmed said that efforts are going on to complete the implementation of logistics projects, which will contribute to reduce the shortage of storage space in order to meet the need of small and medium companies and secure advanced logistics services. With regard to the legal and legislative frameworks set by the State to stimulate investment, he pointed out that important laws have been enacted which have greatly facilitated the establishment of companies in the State of Qatar, including the issuance of the Commercial Companies Law, which abolished minimum capital requirements for the establishment of limited liability companies. The State has provided non-Qatari investors with the opportunity to carry out investment projects in specific economic fields, with a percentage ranging between 49% and 100% in the sectors of agriculture, industry, health, education, tourism, the development and exploitation of natural resources, energy and mining. The State has launched important projects that reflect the values of partnership between the public and private sectors and provided promising investment opportunities in the logistics sector, food security, education, health, tourism and sports. HE the Minister of Economy and Commerce pointed out that these efforts and initiatives have placed the State of Qatar in advanced ranks in various international reports, as the country ranks second in the world in terms of providing a stable macroeconomic environment and eighth globally in the economic performance index and 18th in the Global Competitiveness Index 2016, pointing that Qatar advanced five points in the index of economic freedom for the year 2017, from the 34th position in 2016 to the 29th this year. Sheikh Ahmed said that the Qatari business community, with the support of various government agencies and state institutions, has been able to leverage its resources to boost local production and open new trade channels with many strategic partners around the world. He stressed that Qatar, based on joint efforts between the public and private sectors, has been able to protect the security of its national economy and enhance its status as a regional and global economic power. While Qatar has incurred additional costs in certain areas as a result of arbitrary measures, these costs remain insignificant compared to the natural and financial resources owned by the State, he said, pointing out that the State of Qatar has $335bn in assets in various countries of the world. 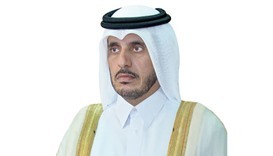 HE the Minister of Economy and Commerce pointed out that the private sector in Qatar, in cooperation with foreign investors in the country, has benefited from the investment opportunities available in many promising economic sectors, contributing to the growth of non-oil sectors, which recorded more than 70% of nominal GDP during 2016. 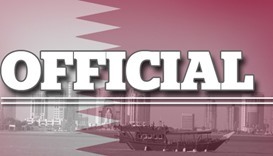 On the measures taken by the State and the steps it intends to take to combat the illegal blockade, he said that the State of Qatar has lodged a formal complaint with the World Trade Organisation (WTO) against the siege countries because of their violation of laws and conventions relating to the trade in goods and services as well as aspects of intellectual property related to trade. The Minister said illegal measures taken by the siege countries are the first of its kind in the history of the WTO. They constitute a clear violation of the global trading system and have serious negative consequences at the regional and global levels, he said. 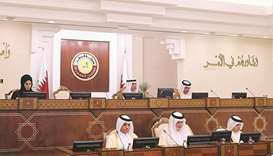 He pointed out that the total volume of trade exchange between Qatar and the countries of the world reached about QR81bn in the second quarter of 2017. Concluding, HE the Minister of Economy and Commerce said that this crisis provided Qatar with an opportunity to identify and enhance its strengths and to address shortcomings in ensuring the resilience of the Qatari economy and sustainable growth to meet the various global and regional economic challenges, stressing that the State has a stimulating and reliable environment for doing business and is an important commercial hub, calling on investors to take advantage of the promising opportunities provided by the State in this field. The Business Council for International Understanding (BCIU) is a nonpartisan, US-based organisation that works to expand international trade and commerce. It does this by helping its member companies engage internationally and by facilitating mutually beneficial relationships between business and government leaders worldwide. With 200 member companies, including many Fortune 500 firms, BCIU delivers strategic insight, worldwide connections and essential services to enable businesses to pursue global growth opportunities. 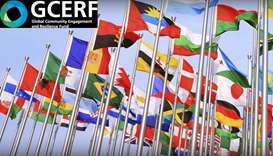 The organisation also offers government officials a forum for engaging multinational enterprises as they promote international trade and investment.